Well, look at that! 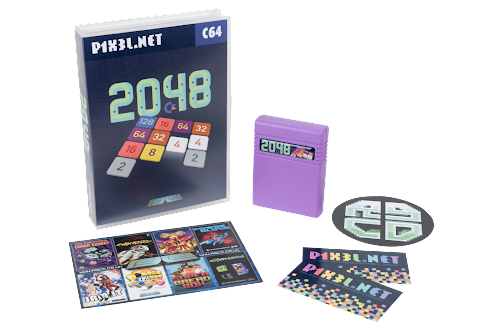 No new C64 releases from us for nine months, and then suddenly three within a few weeks of each other! 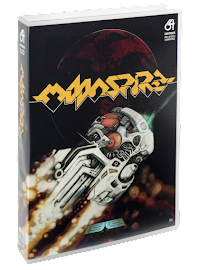 Today we're happy to announce the cartridge release of both MOONSPIRE and C-2048, two games that (like JAM IT) were a looooong time coming. But hey, now they are finally here. Details on each game follows. Join the numbers and get to the 2048 tile! 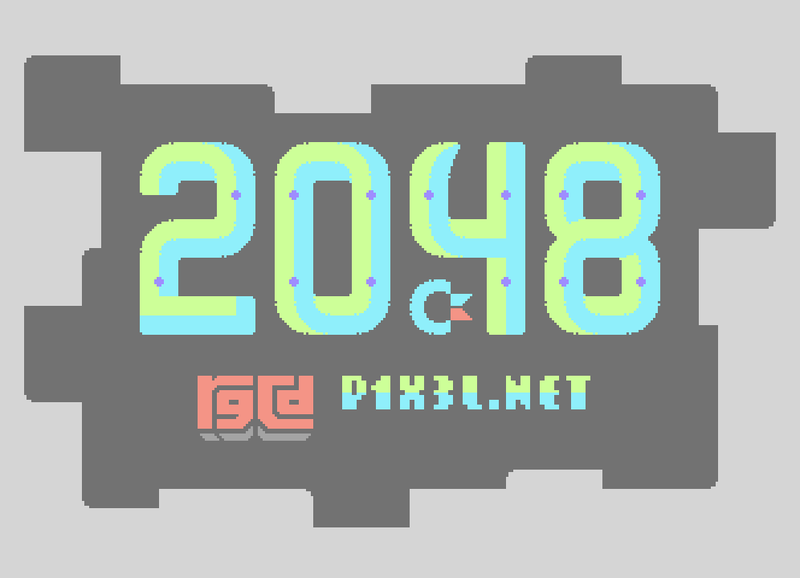 p1x3l.net and RGCD are proud to present C-2048, the super-addictive colliding-numbers game for your Commodore 64 home computer! 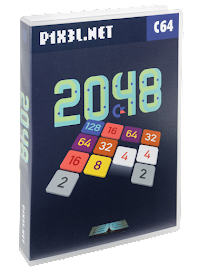 Slide the tiles around the board and collide identical numbers in order to climb up the power-of-two series until you achieve 2048. Each turn a new '2' or '4' stone will appear on the 4x4 grid, meaning that you'll have to choose your moves carefully. Every time you collide two or more tiles, your score increases by their merged value. 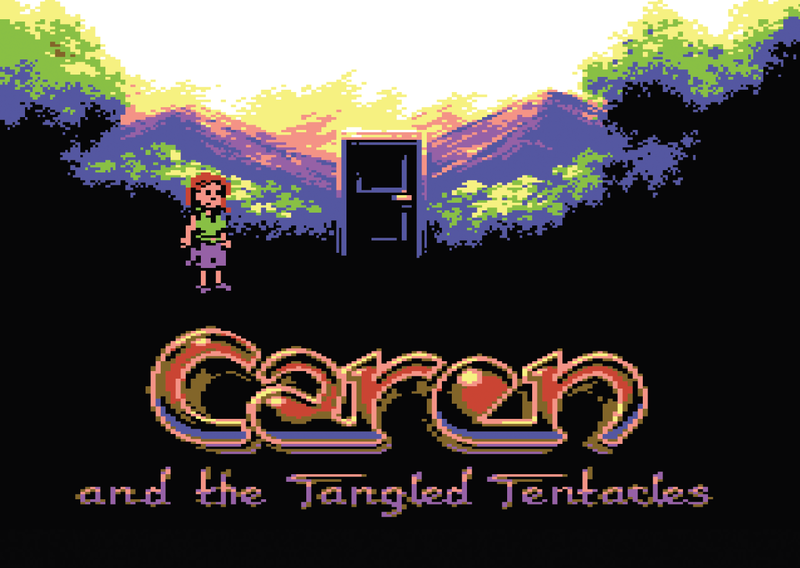 Originally an entrant in RGCD's 2014 C64 16KB Cartridge Competition, this final commercial version of the game features further visual improvements and minor bug-fixes (such as same speed music played on PAL and NTSC systems). For full details on the game, please check out the official press kit HERE. 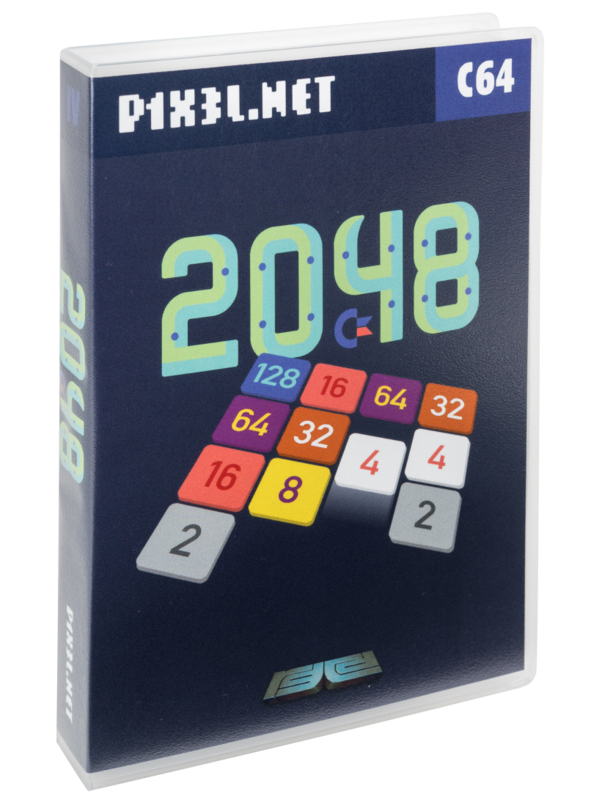 Priced at £22 plus shipping, the retail version of C-2048 is presented in a modified plastic Universal Game Case complete with custom made foam insert (as with the rest of our deluxe range). The cover art was illustrated by Retrofan and the game comes complete with a two p1x3l.net stickers, a large weather-proof vinyl RGCD sticker and an RGCD post-card. Full game instructions are given on the rear of the box. The 16KB PCB is housed in purple cartridge shell, with a 3D domed C-2048 label. Please note that C-2048 is also available for FREE as a downloadable .CRT image here to use via emulation or on real hardware devices such as the Ultimate 1541-II or Turbo Chameleon 64. No-one was prepared for the Draxx onslaught on Arcturus 7. Thousands of lives were lost in the initial attack, and hundreds more in the chaotic aftermath. The remaining human colonists rallied and began to strategize a retaliation, but it was too late. The Draxx had called back their forces to the far side of the planet's only moon - taking with them the control orbs from the now rapidly cooling thermal-boosters, halting the terraforming process and reverting the planet back to an inhabitable and desolate ice world. YOU are mankind's only hope. Infiltrate the Draxx MOONSPIRE, cause as much devastation as possible and reclaim the stolen orbs! MOONSPIRE is a sprawling flip-screen exploratory sci-fi shmup developed for the 1983 Commodore 64 home computer by Dušan Milivojević. Initially created as a short one-level demo back in 2014, this final six-level commercial release of the game features over 260 screens to fight through, enhanced firing mechanics and audio by Ari "agemixer" Yliaho. MOONSPIRE has full NTSC support, and the game and music run at the same speed as on PAL systems. Priced at £30 plus shipping, MOONSPIRE is presented in a modified plastic Universal Game Case complete with custom made foam insert (as with the rest of our deluxe range). The cover art was illustrated by Harris Kladis and the game comes complete with a professionally printed 20-page manual, large weather-proof vinyl RGCD sticker, a post-card and a 170gsm matt-coated A3 poster. 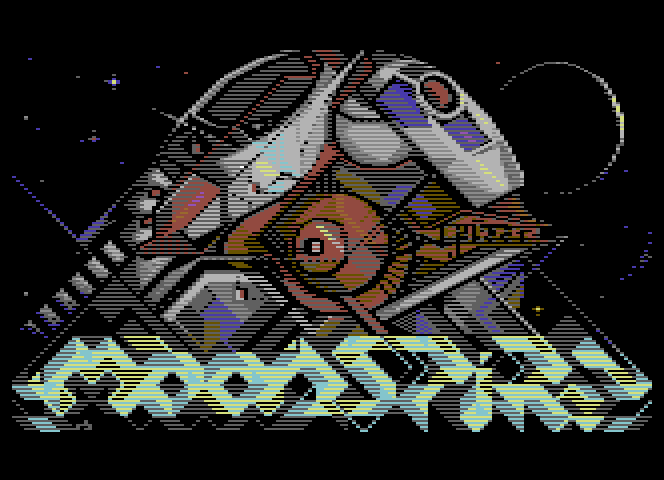 The 64KB PCB is housed in white cartridge shell, with a 3D domed MOONSPIRE label. Please note that MOONSPIRE is also available to buy HERE for $2.99 (plus EU VAT) as a downloadable .CRT image here to use via emulation or on real hardware devices such as the Ultimate 1541-II or Turbo Chameleon 64. For £5 plus shipping, a poster bundle is also available to buy HERE, consisting of an A2 and an A3 poster sent to you rolled in a reinforced tube. 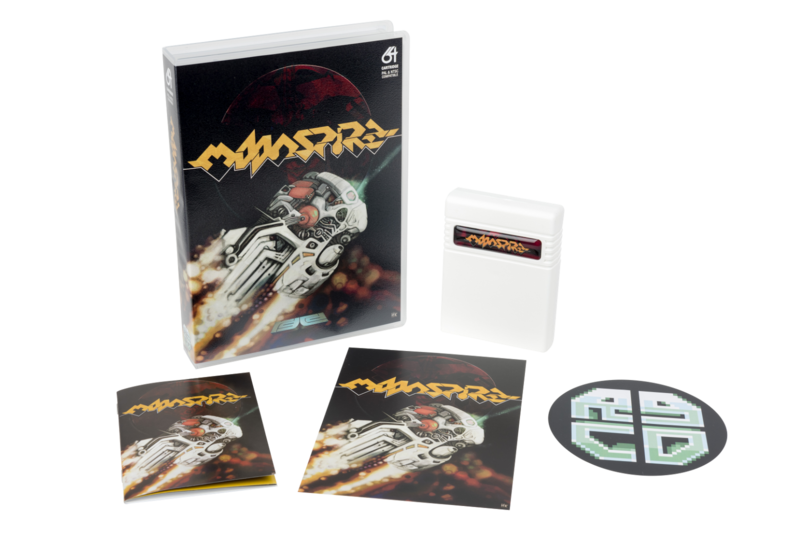 Purchases of the cartridge or poster bundle include the downloadable version of the game for free. Just two more news pieces before signing off; first of all, JAM IT is now back in stock after selling out last week. Only 17 copies left at the time of writing, so grab yours now. Holy 8-Bits! A Commodore 64 Bundle?